If you're someone who likes to nap in their car during a lunch break, then be sure to pick either a Clubman or any car with fully reclinable seats. We’ve all had that day where just a few precious moments of extra sleep can be the difference between staring at the wall for eight hours and actually making some progress at work. It’s not unheard of to take a nap at work, and in fact some companies encourage it. To get away from the bustle of your office, though, you’ll need a place to retreat to. For those commuters out there, we’re talking about your car. For a good car to sleep in, you’ll want some features like seats that can go all the way back and big enough to sprawl out in. Contrary to popular belief, Mini creates some spacious cars, relatively. The Clubman already has a lot of space for groceries and the like, and with the back seats folded down provides ample room for an average height male to sprawl out on his lunch break for an afternoon nap. The windows can already come tinted from the factory in the back as well as the sunroof, so there won’t be too much light creeping in. Store a blanket, perhaps a mat and a pillow, you’re good to go. Just because they were so big and simple, 1980s GMC Suburbans were definitely one of the best cars to sleep in. With almost 97 cubic feet of cargo space, from the tailgate to second row seat, you can easily remove the third row and plant a mattress to sleep on during long road trips. 1980s Suburbans are good for this because emptying out the cab of seats is as simple as removing a couple of bolts and sliding the rows out of the car through the back. Also, in terms of reliability they are impossible to kill. Far and away the best vehicle for sleeping in is the 2002 Ford E-250 Extended Cargo Van. 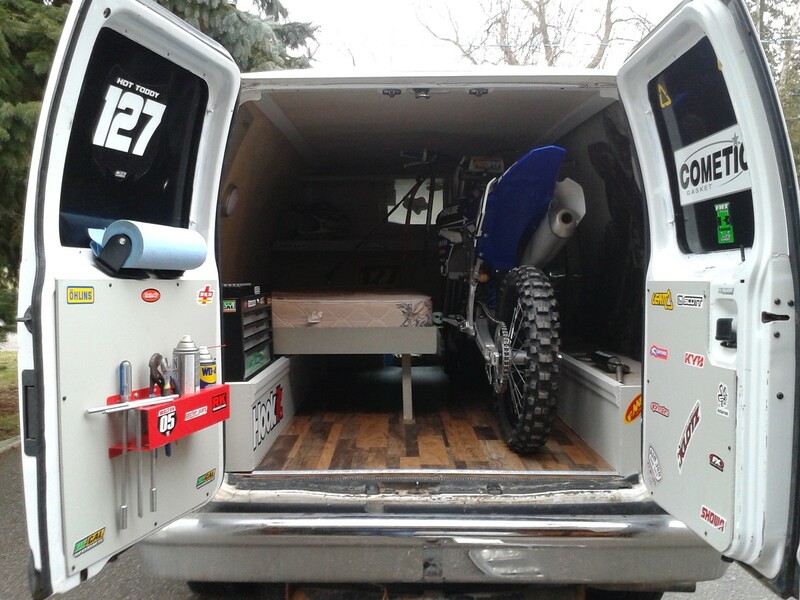 There is enough room in that cargo area to build a bed, install a shower and tool box, and still have enough room left over for a motorcycle. If you get one with the 5.4-liter Triton V8 you’ll have enough power to pass people on the freeway as well. There is virtually no downside fo this van, except in how much of your street parking it takes up. Some Mercedes have this ability, some other cars and manufactures do not. When you’re out to buy a car and sleeping is an important part of your day, just test the electric seats and see how far back they recline. Some seats will go completely flat, like the Mercury Villager’s seats or the Nissan Quest, according to some drivers. Many minivans have this ability as well, as do some compact cars like a Honda Fit. Perhaps the most obvious choice is a station wagon with middle row(s) that lie flat. There’s enough room for two people to lie down, which means it’s great for those long picnic days where after you’re done eating you just want to nap for an hour or so with the warmth of the sun comforting you like a warm blanket. Of course while station wagons aren’t being made anymore under the guise of their names’ sake, crossovers can somewhat bridge the gap between car and what was once considered a wagon. It seems fairly obvious that a big car is the best option for sleeping inside, but there are other elements to this equation that aren’t entirely appreciated. Good ventilation, shielding from the sun and a working A/C system are what come to mind. As long as your car has those amenities, and has seats that fold down flat (or can be removed easily) then you’re golden to sneak off to the parking lot outside of your office and catch a couple of Zs.